Kheer potol or kheer bhorapotol or parwal sweet is a unique, drool-worthy Bengali sweet dish. Which is basically made with the pointed gourd, stuffed with khoya and flavored with cardamom powder and saffron. The first time I had the chance to have this was in a friend’s place in Calcutta. Not knowing it was made with pointed gourd till my last bite. It was that delicious… Now as Durga Puja is approaching, here in Calcutta, I can see the zeal and enthusiasm almost everywhere. This festival is always close to my heart. Durga puja begins with Mahalaya(the 1st day) and ends with Dussehra / Vijayadashami (the 10th day). Navaratri is synonymous with it. This is the most awaited festival of Eastern states of India. Especially in West Bengal. It is the celebration of the victory of good over evil and truth over lies. In West Bengal, Durga puja would not be complete without distributing sweets. Starting from Dussehra Bengalis visit their friends, relatives, and neighbors with sweets in hand and exchange greetings. And it continues for a month. So this sweet is just perfect to surprise your near and dear ones. To make this kheer potol, it is always best to use the homemade khoya. But if you find it long or you are in a shortage of time, you can use the store brought one instead. However, food color and silver warq are used to make it more attractive. Which I haven’t. As I want to keep this simple. To achieve this beautiful green color I have used baking soda here. So enjoy this Navratri, Durgapuja, Dussehra, and Diwali with this delicious and unique sweet recipe and surprise your loved ones. First combine milk and saffron together in a bowl and set aside for 1/2 an hour. In the meanwhile wash and peel the potol. Now make a slit on each potol in such a way that the other side remains joined. Then with the back side of a spoon scrape out the pulp and seeds. Boil the potol with enough water in a big vessel by adding baking soda. Let them boil for 6-7 minutes. Then transfer the potols to a strainer over a bowl. Grate the khoya, if you are using the readymade one. Heat a pan. Add ghee and roast the khoya on medium heat for few seconds. Add sugar, saffron infused milk, and cardamom powder. Roast until all the water evaporates. Once done, add chopped almonds and pistachios. Mix well. Transfer the mixture to a plate and leave it for cooling down. Heat sugar and water together in a shallow pan. Let the sugar dissolves completely. Stir in between. Once done add green cardamom powder. Stir well. Add potols in the hot sugar syrup. Cook them till soften and their color changes. Then turn off the flame. Transfer the potols to a strainer placed over a bowl. Let them cool down and strain the extra syrup. Now transfer the sweet potols to a serving plate and generously fill each potol with the khoya stuffing. Garnish with sliced almonds and pistachios and saffron strands on top. Then refrigerate and serve cold. Add ghee only if you are using readymade khoya. Saffron or Kesar is optional. It can be skipped, if it is not available. This is totally a new dish to me, you have explained so well. I am really tempted to try this sweet. This dish sounds so unique and I have heard about it. This must be having awesome taste. 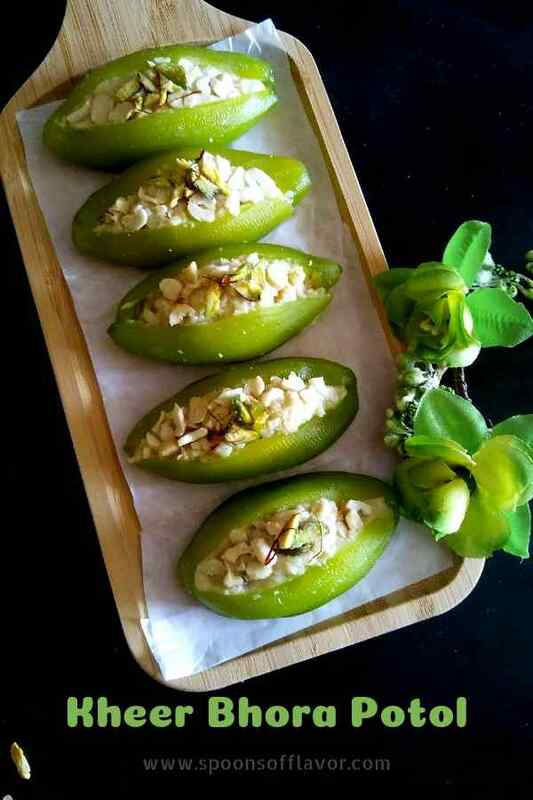 This dish is totally new to me…I'm really curious to know how the stuffed parwal in its sweet avatar taste…got to try it out sometime..Thanks for this share!! Never had a chance to taste these Kheer potol. Looks like a super rich and dangerously delicious sweet. Absolutely delectable. Omg! This is a totally new n yummy with all the delicious ingredients I love. Looks so delicious, I had earlier seen one of this kind. Nice share. Many time heard about this sweet , but never tried or tasted. You made it so nicely. Looks amazing. Can't believe my eyes that you can create a sweet from Parwal, amazing! Absolutely delicious looking sweet. Kheer in potol sounds very interesting . It looks so yummy .Thanks for introducing to the new recipe. Kheer in potol sounds very interesting. It looks so yummy. Thanks for introducing to the new recipe.